Manchester United are ready to take our transfer business across to the nearest country outside England as reports continue to link Celtic left back, Keiran Tierney to a move to Old Trafford. 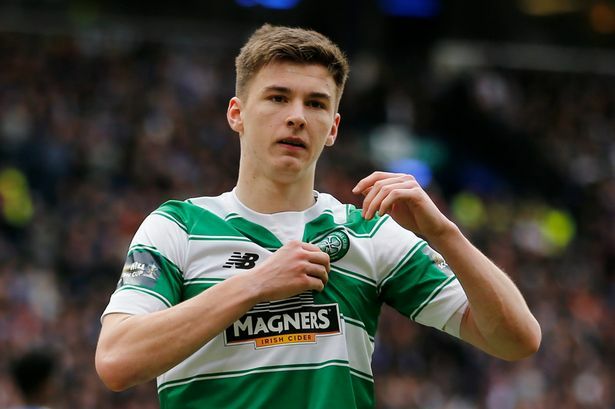 Despite reports suggesting that we have finished our transfer business following the re-signing of Zlatan Ibrahimovic, a former Celtic player has claimed that Tierney is the number 1 target to sort out the long term left back area of the club as Luke Shaw has failed to impress in his three years at the Theatre of Dreams and Daley Blind is not a long-term option given that he has only a year left on his current deal and there have been no talks to give him a new contract. Tierney has developed under the tutelage of former Liverpool boss, Brendan Rodgers and has become one of the best young left backs in the whole of Europe. The 20-year-old has wowed admirers with his impressive repertoire of skills that are used in defensive and offensive situations, ensuring that he is a complete player. Mourinho has also used Ashley Young and Matteo Darmian in that role, which goes to show that there are issues and Tierney will solve if signed. Former Celtic striker, John Hartson told the BBC Scottish Football Podcast, via The Mirror, that the 20-year-old is the Red Devils’ No.1 target. It is interesting to see whether we will make a move for the defender given that Luke Shaw is nearing full fitness and has reportedly impressed his manager, Jose Mourinho who questioned his confidence and willingness to play through the pain barrier last term. The Scottish youngster has been a revelation under the tutelage of Brendan Rodgers, emerging as one of Europe’s finest prospects. He is a left back known for his offensive contributions while not neglecting his defensive responsibility. He broke into the team in 2014 and has scored 4 goals in 85 matches for the Scottish champions.